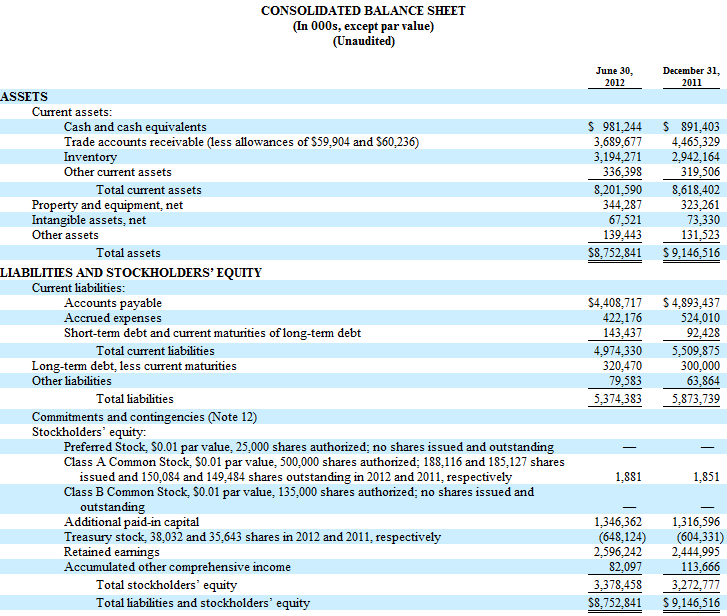 It’s a healthy looking balance sheet with 517M in net cash after accounting for the short-term and long-term debt, or $3.45 per share. All this cash is however already gone: IM decided to acquire Brightpoint for $840 million (including $190 million in debt). Both are distributors of IT products, but Brightpoint is focused only on mobile products while Ingram Micro sells a lot of ‘traditional IT products’ used in personal computers and servers. For now I’ll talk about Ingram Micro as it is today, more about Brightpoint later. One problem for IM is that most of the cash (~$720M) is located outside the US. Since the value of a company is ultimately determined by the dividends it is able to pay, and overseas cash cannot be used to pay dividends (or buy businesses in the US), I think the cash on the balance sheet needs to be discounted. I’m not sure by how much however since I don’t exactly know how much taxes IM should pay if it want to repatriate the cash (35%? ), and at the same time there is a decent opportunity that there will be a tax holiday in the future so it could be done tax free. So question for hopefully a more knowledgeable reader: by how much should the cash be discounted? The biggest items on the balance sheet are accounts receivable, inventory and accounts payable. These are assets that cannot be separated from the business without liquidating the company, so it makes more sense to value the company based on it’s earnings power. I also don’t think you should have the idea that these assets provide a large margin of safety. If you start discounting some of the receivables or the inventory a bit – reasonable in a liquidation scenario – you find that the adjusted book value of the company drops quite fast because it does have a lot of liabilities compared to it’s total assets. Being a bit lazy I grabbed some key statistics from Morningstar for the past 10 years. It’s clearly visible that Ingram Micro has razor thin margins, but it does have a decent history in growing book value per share, but it’s not great with a CAGR around 8.5%. Average earnings for the past ten years and the past five years are respectively $0.74 and $0.95 per share. Given the revenue numbers using the average of the past five years seems reasonable since it seems that growth has stalled since 2007. In July 2012, we announced that we had signed a definitive agreement to acquire BrightPoint, Inc. (“BrightPoint”), a global leader in providing device lifecycle services to the wireless industry. We believe, this acquisition will greatly enhance our global position in mobility as well as our fee-for-service logistics offerings. We expect to realize annual cost synergies and efficiencies in excess of $55,000 by 2014, and the transaction is expected to be accretive to earnings per share by $0.18 per diluted share in 2013 and $0.35 per diluted share in 2014, excluding one-time charges and integration costs. I’m a bit more sceptical though. The two companies are similar and have thin margins: Ingram Micro has a relatively stable gross margin that averages 5.5% the past 10 years (currently at 5.3%) while Brightpoint has a slightly higher average margin at 6.9% (currently at 6.8). Net margins are really razor thin: IM has an average 0.83% operating margin while Brightpoint has an average of 0.68% (a number that’s depressed because of a really bad 2008). Obviously Ingram Micro’s management is expecting synergies and cost savings by combining the two businesses, but buying a similar business for more than 2x book value while your own business is trading for ~0.7x book value doesn’t seem to be a smart allocation of capital to me. An alternative valuation metric is to look at price/sales multiple. Ingram Micro is currently trading at a 0.07 multiple while it is willing to pay a 0.14 multiple for Brightpoint. And that is ignoring the different capital structure: IM has a significant net cash position while Brightpoint has significant debt. Seems to me that you need a lot of synergies just to make the Brightpoint acquisition equally attractive as investing in your own stock. Insiders own an insignificant part of the company (5.6%) and the history of insider transactions also doesn’t give a lot of confidence. It’s mostly a lot of small option exercises directly followed by a sale of the shares acquired. Positive is that the company is investing a decent amount in repurchasing shares. They started a 400M repurchase program two years ago and have bought 15.2M shares so far for $276M (~10% of outstanding shares). It at least shows that management is willing to return money to shareholders, but for this to be truly great you of course need a company that’s undervalued. Providing a narrow range for the intrinsic value of Ingram Micro is though for me, but I think one key question is how much faith you have in the current Brightpoint acquisition and possible future acquisitions. In that case you could build a valuation on the performance of the years after 2008, and include management expectations of increased earnings per share after 2013. In this case IM is obviously undervalued. It does currently have a PE of 6.9 excluding cash, and if you expect good return on the money spent on Brightpoint and future acquisitions that’s too low for sure. That wouldn’t be an expectation based on historical performance though. If we would expect that the company will in the future grow book value at the same rate as in the past it probably deserves to trade at a discount. The company managed to grow book value at 8.5% the past 10 years, and that would probably be a bit too low expected rate of return for some investors. It’s not that terrible though so a big discount to book value doesn’t seem to be warranted. An, admittedly superficial, look at Ingram Micro reveals a company that has thin margins, but a reasonable history of profitability. You certainly shouldn’t expect high returns on equity, and I don’t think it deserves to trade above book value. Question is: does it deserve to trade at the current 30% discount? If I would be forced to create a range of the intrinsic value of Ingram Micro the current price is probably on the low end of that range: I think it’s harder to make a case that the company is currently overvalued than that it is undervalued. I don’t think there is a large margin of safety at the current price though. It’s far from certain that the Brightpoint acquisition is going to be a success, and the lack of insider ownership or buys isn’t a vote of confidence. The current price is probably reasonable close to fair value. This entry was posted in Research and tagged IM on September 10, 2012 by Alpha Vulture. Ingram would pay the tax differential if they repatriate. If companies are reluctant to repatriate, presumably it’s because they’ve targeted earning profits in various low/lower tax regimes overseas. Those rates could be anywhere between 0% and 20%, I suspect – and, at a guess, the average rate might be 10-15%. That suggests a 20-25% tax differential would be triggered upon repatriation. In my experience, I wouldn’t necessarily discount the cash… I think it depends on the financial strength of the company, actually. A strong company can afford to wait – the government will cave eventually, and offer a new 5-10% repatriation – they just have to figure out first how to sell it/bamboozle the public! Since that’s some way in the future, I see no need to apply a discount there. There are some financial arrangements meanwhile that reduce the drag of this ‘trapped’ cash – there also used to be some share buyback scheme loopholes to exploit but these may have been shut down since. Finally, they can always buy overseas assets/businesses to solve the problem – if they are smart/growing, that should be on the agenda anyway. For a weak/declining company in this situation, I would probably discount aggressively – in fact, a lot more than the tax differential implies. Because they are probably v dependent on that tax juicing each year, they can’t afford a repatriation tax hit, their decision-making & strategy will inevitably be compromised & become sub-optimal, the US end of their business will become over-levered – and finally, to add final injury & despite all that pain, they’ll likely crack at the worst moment & take the hit amid other kitchen sink write-downs. Avon Products (AVP:US) strikes me, for example, as one of the bigger companies exhibiting some of these attributes. Thanks for the comment, makes sense. Think this would imply for IM that only a small discount would be appropriate. Their balance sheet isn’t going to be very leveraged post acquisition, and while they might have trouble earning their cost of capital I don’t think there is a big risk that they get in real trouble and are forced to repatriate (significant amounts of) cash.